On this blog there’s a whole category of posts dedicated to specific volleyball games. In this post, though, I want to share some ideas for a few different types of volleyball games that have broad use. They are also ones players enjoy! This group of games is often called King or Queen of the Court, or Winners. The basic idea is that if you win the rally you get to stay on the court. If you lose, you go off and someone else comes on. Usually, the team that stays on gets the first ball to start the next rally. Because you’re playing just a single rally before teams change, these games are fast-moving. Normally, you use small teams (like 3s). Also, you want to keep the number of teams low so no one sits out for long. Players like these kinds of games because of the competitiveness and how fast things go. They also like that they can use all different skills and get a lot more contacts than is true when playing 6s. From a coaching perspective, these types of volleyball games are great because they are very flexible. There are all kinds of ways you can adjust them to focus on what you want to practice. You can start them with a serve, a free ball, or some kind of attacked ball depending on your priorities. If you play 3s, you can require each player touch the ball before it goes over the net to work on communication and coordination. Want to work on your quick offense? Designate a player who must run quick – such as the non-passer who isn’t setting. 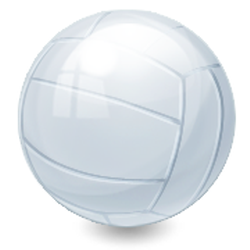 Want your setters to get lots of reps? Fix them on the court or have them rotate separately from the rest. Looking to work on out-of-system offense? Require a non-setter to take the initial second ball. Just about anything you want to work on in a game play context can be incorporated into these sorts of games. By the way, there’s a variation on the Winners idea where the losing team stays instead. The Belly Drill is an example. Sometimes playing volleyball games on a full court just doesn’t work. This is especially true if you’re playing small-sided games and/or you have younger or less experienced players. If that’s the case, think about making the court smaller. Here’s an example. When I have taught volleyball as a university P.E. class I always started with a narrow court – even if I had 5 or 6 players on a side. The students were relatively new to the game. They could not cover a lot of space. Putting them on a smaller court let them have more rallies, making things a lot more fun. It let me get them first focused on playing 3 contacts, then getting to the point of attacking the third ball. As their skills improved, I expanded the court. For more experienced players, using a smaller court is a great way to increase rallies. The players have less area to defend, so they tend to dig more balls. That means more balls going back and forth across the net. Longer rallies tend to mean more fun. You can also use a narrow court to force more blocking. A lot of times in small-side games like the Winners types games mentioned above, there isn’t a lot of blocking. We want hitters working on attacking against a block. By reducing the width of the net for the game we give the block more opportunity. You can then take things a step further to force players to block by requiring a certain number of them to be at the net. For example, say you’re play 4 v 4 on a half court. If you require the teams to play with two at the net you increase the chances of attackers facing a decent block. I should note that in many parts of the world younger players play small-sided volleyball games on smaller courts. For example, in England I saw them have U14s playing 4 v 4 on a badminton court. That way they get a combination of the benefits of having fewer people and less area to cover. One final way you can mix things up and make games more interesting is by changing up how they are scored. There are two main ways you can do this. One is to use bonus points or to otherwise set rules for what counts as a point. For example, you could say scoring on a quick attack is worth two points rather than one. Or your could allow teams to only score on earned points – kills, blocks, and aces. The other way is to use a wash type of scoring system. This way of scoring requires a team to win multiple rallies in order to get a point. One example of this would be if a team wins the first ball, they then get a free ball. If they also win that they earn a point. You could require 3 in a row, or 2-out-of-3, or whatever makes sense for what you want to do. Lots of different ways to do it. If you’re looking for a fun volleyball related game, you should consider vollis, to use John Kessel’s term for it. In Europe and some other places it’s referred to as bagherone or baggar tennis. Basically, it’s a volleyball form of tennis where you play 1-touch. There are several different variations of Vollis. One is to play just inside the 3m lines, so short court. The most common way that is done is with one team on each side playing on a rotating basis. It’s a 1 v 1 game, but after a player touches the ball they go to the back of their team’s line and the next player steps in. You can also play the same way full court, and even add players to make it 2 v 2. The variation of the game my teams seem to like a lot is what’s called Brazilian 2-ball. In this variation there are two players on each side and the initial balls are underhand served in, one from each side. They play until both balls are dead, then both teams rotate out. In order to win a point, one team needs to win both balls. It gets really competitive! I’ve offered up a few different ways you can mix things up to play different types of volleyball games. Really, you’re only limited by your imagination. Think about what you want to work on and how you can mix things up to keep it fresh, fun, and exciting. Got a favorite type of volleyball game? I’d love to hear it. Tell us about it in the comment section below!